Oats are an easy-to-digest grain and have been a healthy food source for humans and animals for thousands of years. But were you aware that oats boast amazing beauty benefits as well? Oat oil is extracted from the oat kernel. The ancient Greeks and Romans used oats for medicinal purposes and regularly soothed their skin with oat baths. We now know oat oil can be extracted from the kernels and that it contains many useful nutrients for the skin. Oat oil is very nutrient-dense and effective, making it an attractive, natural cosmetic ingredient. This is why we have added it to our Squalan Eye serum. Not all oat oils are created equal: there is quite a range in terms of quality. We were determined to find the crème de la crème of oat oils, which is how we came across oat oil extracted from Ecocert certified oats: Avena Sativa Kernel Extract. This particular organic oat oil captured our interest because it won the 2015 BSB Innovation award in the category ‘most functional product’. It is a high-quality, rich, natural oat oil with a unique lipid profile that balances the skin’s oil levels. To clarify, lipids are a naturally-occurring fatty substance found in the body. The cosmetics industry frequently uses the term ceramides when referring to a group of lipid molecules. Ceramides are a type of oily wax found in the upper layers of the skin. They form a protective, waterproof layer that prevents moisture loss. Ceramide production decreases in adults as they age, leading to dryness and wrinkles. Applying a lipid/ceramide oil to your skin helps counteract this process externally by restoring the skin’s moisture balance. The high concentrations of vitamin E and linoleic acid in oat oil support this process further. Oat oil is readily absorbed by the skin, leaving a non-greasy feel. It soothes and heals the skin, ensuring fewer spots, blackheads, and small scars. This is why it is often added to eye serums, anti-ageing creams, and after-sun products. The oat oil used in our EYE serum is 100% organic, is completely gluten-free, and does not contain any egg whites. Our entire product line has been allergy certified and is therefore suited to even the most sensitive of skins. It goes without saying that our eye serum also contains our all-time favourite ingredient squalane – a substance produced naturally by the body. 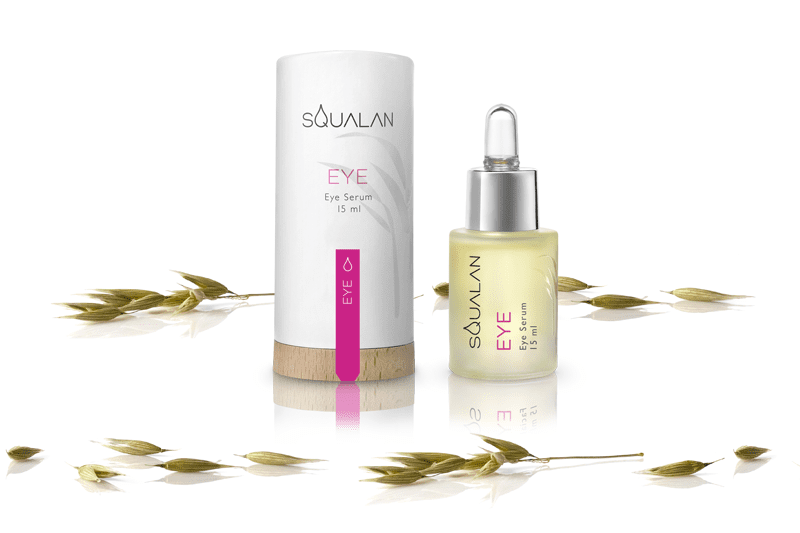 Oat oil and squalane have proven to be a match made in heaven when it comes to the delicate skin around the eyes, which is why they are both core ingredients in our eye serum. Squalene, squalane, squalan: what is the difference?